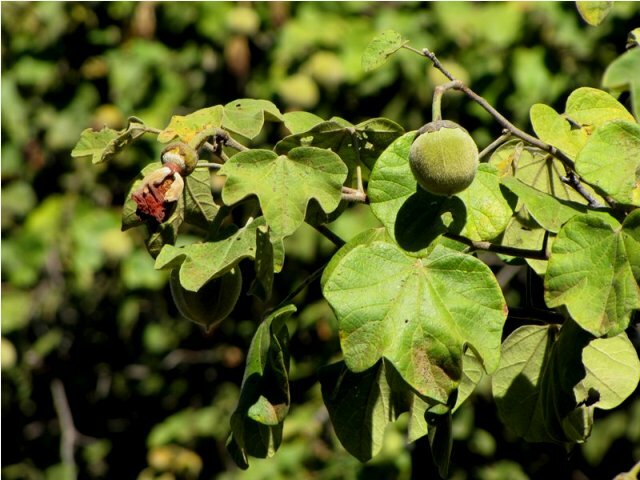 Morojwa is a valuable edible indigenous fruit tree species confined to east and southern Africa. 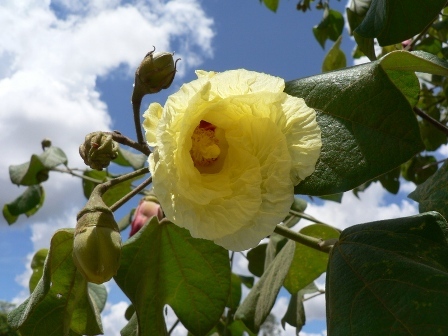 This plant is found in Botswana, Kenya, Malawi, Mozambique, Namibia, South Africa, Tanzania, Zambia and Zimbabwe. It is semi-domesticated by people in Botswana. It is an important source of food for local people there. The species grows naturally in all types of woodlands from sea level to about 1700 m above sea level receiving annual rainfall from 250mm to 1270mm. The plants are found on or near termite mounds and deserted village fields. forking from the base, and the stem can reach up to 25cm in diameter breast height. The bark is rough and greyish-black to brown, fibrous with longitudinal fissures. The twigs are hairy when young but become smooth with age and branches have wooly hairs. 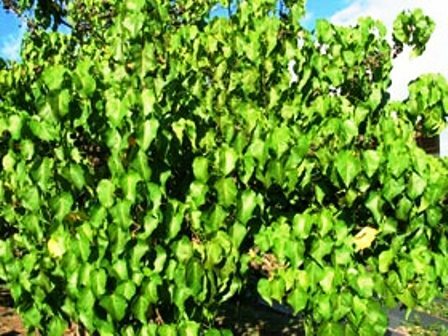 The leaves are distinctively rounded 8 by 12 cm on long stalks. They are always simple, alternate and roundish. 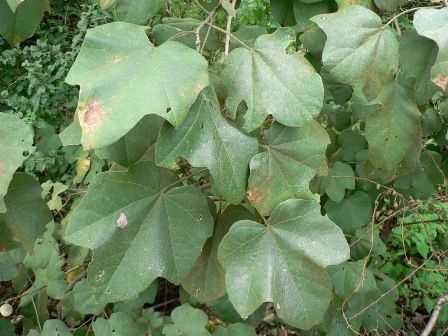 The leaves have 3 to 5 lobes, which are covered in brown star-shaped hairs, and have longitudinal fissures. Flowers are large up to 6 cm long, solitary on long pedicels in axils of uppermost leaves. The flowers have a conspicuous cup like calyx with which the calyx is fused. The flowers have many stamens and 5 petals, which are yellow or purplish in colour with dark purple or dark red centre. The flowers are bisexual with all floral parts in five’s. They are showy yellow, ageing to purplish in colour with a maroon patch at the base of each petal. It flowers in wet season and fruits in dry season. The fruits are spherical and woody, 2.5cm to 4cm in diameter long with short hairs. The fruits are divided into 4 to 5 sections. They are yellowish to brownish green and hairy when mature and tardily dehiscent. Despite their hard woody nature the fruits are edible and chewed like a chewing gum producing a sweet glutinous slime. Fruits start maturing from August. The seeds are hemispherical in shape, up to10mm long and 7mm thick with brownish and woolly floss. The fruits are eaten while slightly green or when ripe. They are persistent, therefore are picked on repining. Some people dry them and reconstitute them. The fruits can be soaked in a small amount of water to make jelly. They can also be boiled and used as relish or made into porridge. The fruits are also sold in the local markets of small towns in many African countries. Beside fruits, the leaves of morojwa are cooked as a vegetable and made into a relish. These are also used as fodder for cattle. The wood is used as timber and for some other agricultural purposes. New plants of morojwa can be raised from seed. The seeds germinate readily when conditions are favourable. The seeds can achieve acceptable germination percentages without any pre-treatment. The species has great potential to be used an agroforestry species. No organized planting of has been reported anywhere yet. Therefore it is recommended that farmers should be encouraged to establish small plantations or orchards of the species.